St Lucia, 5 dollars, 1986. 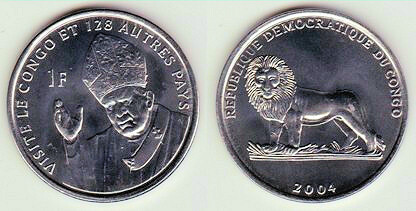 Vatican, 20 euro cents, 2002. You asked for it. This millennium only, skipped Poland and Vatican. Most are proof only, many coloured, none circulated. Thanks, Figgers. Yes, it's true there aren't many decent ones, so I'll only display two. 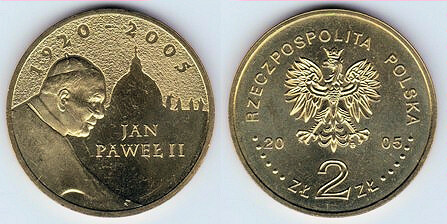 There's another 2 zloty commemorative. While it would indeed not make much sense to add every Vatican coin featuring John Paul II, here is one that was issued last year, on the occasion of JP's beatification. The portrait is much better in my opinion than the one they picked for the 20 cent ("euro cents"?) coin and the other 2002 denominations. Those cheeks ... Anyway, the beatification piece shows a younger John Paul, I think. Croatia, 1000 kuna, 1994. Gold.